Photo above: Gov. Larry Hogan talks to reporters outside the State House in the final hours of the General Assembly session. Gov. 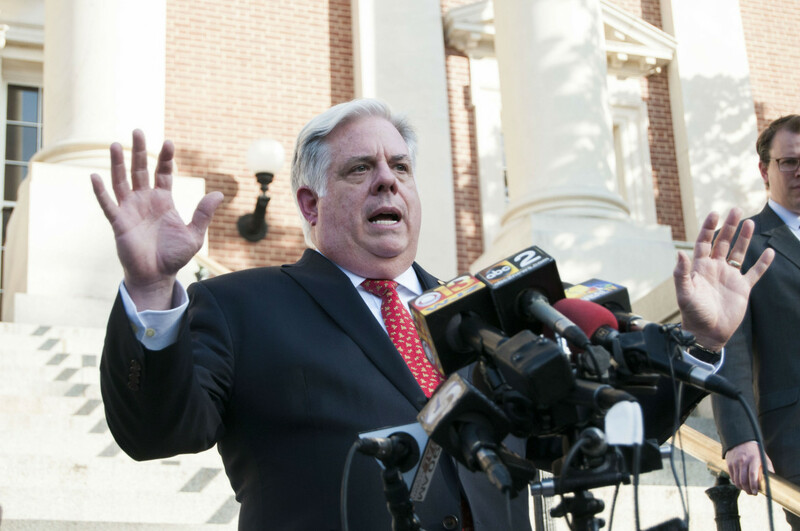 Larry Hogan and the Maryland legislature were so near, but yet so far. An amended version of the governor’s $40 billion budget passed overwhelmingly several weeks ago – drawing strong Republican support and thank you letters from Hogan’s budget secretary. But on the last day of the session, the final version working out differences between the House and Senate passed on a strictly party line vote. After meeting with Hogan Monday morning, all the GOP senators and delegates who had backed the earlier version voted against the final one. Hogan had preached bipartisanship since his election, but he ultimately rejected compromises he had initially favored. CLARIFICATION, 3 p.m. It is more accurate to say that Hogan rejected compromises on the budget Democratic legislators believed he had accepted, but his staff members said he had never fully agreed to. The Democratic legislature in turn gave the new Republican governor just a couple slices of his modest agenda. Military retirees over 50 will now get a $10,000 income tax exemption on their pensions, up from $5,000. But Hogan wanted to exempt all of their retirement pay phased over four years. His proposed changes to expand the number of public charter schools were stripped of key provisions that would have allowed non-certified teachers who weren’t unionized. Tax breaks for businesses contributing to public and private schools went nowhere, while the legislature added more funding for private schools in the final budget. A tax break for small businesses exempting them from the personal property tax did not pass. Hogan’s attempt to repeal automatic increases in the gas tax went nowhere. In one small success, Hogan’s proposal to reinstitute the income tax check-off for the public campaign finance fund that helped him get elected did get enacted. But the legislature was taking no chances and rushed through legislation on the last day that will force Hogan to spend the extra money. But Hogan could veto that bill, SB183. Hogan himself was not declaring victory in his first legislative session, but he did cite progress in restraining spending growth while enacting no new taxes. “We did not get everything we wanted and the legislature did not get everything it wanted, but Marylanders will benefit from the passage of the repeal of the rain tax, important improvements in our charter school law, and tax relief for retired military,” Hogan said. A key sticking point for Hogan was the legislature’s cutting of a supplemental $75 million into the state pension system. “While I have reservations about the General Assembly’s actions on the budget, I am proud to have ended the session on a high note by reining in spending, cutting taxes, providing record investment in education and changing the overall trajectory of the state,” Hogan said. Democratic lawmakers, including House Speaker Michael Busch expressed far more disappointment than Miller with Hogan’s performance. Sen. Jim Rosapepe, Prince George’s, part of the Senate’s progressive wing, told his colleagues. “Now we get to the 11th hour and the governor just can’t take yes for an answer,” with the legislature approving the vast majority of his spending plan. “There’s blame on both sides,” Miller countered. Demonstrators chanting “Don’t shortchange Maryland” at the end of Gov. Larry Hogan’s news conference outside the State House Monday.